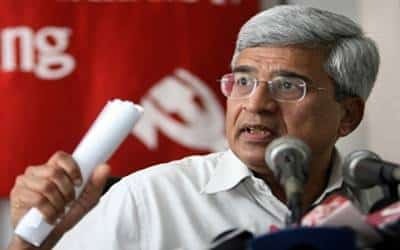 New Delhi, Feb 15 (IANS) CPI-M leader Prakash Karat on Monday took pot-shots at Home Minister Rajnath Singh for saying that Pakistan-based Lashkar-e-Taiba chief Hafiz Saeed backed the Afzal Guru event at the Jawaharlal Nehru University campus here. "The home minister relies on a fake Twitter handle for information," Karat, who visited the campus on Monday, told the media. The Communist Party of India-Marxist leader said: "We don’t accept their (central government’s) definition and version of nationalism. If they call us anti-national, we wear it as a badge of honour." Karat also said that by filing "cases against elected student leaders under sedition charge", the government was "declaring war" against them. The Jawaharlal Nehru University (JNU) has been on the boil over the arrest of its students’ union president Kanhaiya Kumar on sedition charges after some students organised a meet to mark the anniversaries of executions of Parliament attack convict Afzal Guru and Jammu Kashmir Liberation Front co-founder Maqbool Bhat. Anti-India slogans were raised at the gathering. Delhi Police on Thursday registered a sedition case and arrested Kanhaiya Kumar. He was sent to three days’ police custody on Friday although he denied raising the anti-India slogans.